Here is another melt-in-your mouth recipe for your enjoyment. I chose this one as a finally for this year’s recipes mentioned in my preview of Christmas cookies post. I am getting myself so hungry for sweets, sitting here today and writing up these recipes and salivating over all the pictures of cookies. Hopefully you find them enticing enough to make them, and share your comments with all of us in the blog land. Meanwhile, here is a recipe for Ginger Chocolate Truffles. Add cream cheese into a large mixing bowl, and mix with an electric mixer until smooth. Mix powdered sugar with ginger. Gradually add to cream cheese and mix well. Add melted chocolate, and mix until combined. Shape the chilled mixture into 1-inch balls. Roll in almonds, or any other of your favorite coatings. Store in an airtight container in the fridge, for up to 2 weeks (if you can keep away from them for that long..). My favorite coating is the cocoa powder. 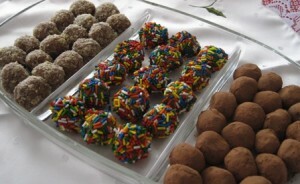 These truffles tend to get quite soft is kept out of fridge for a long time. For best results, please store in the fridge, in an airtight container.